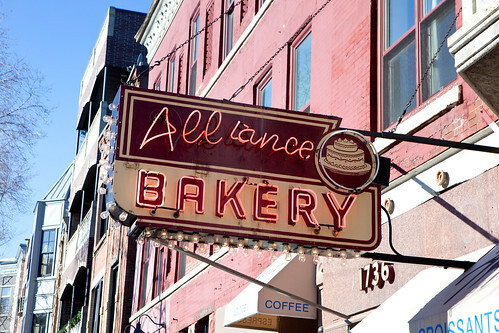 Alliance Bakery located in Wicker Park, Chicago looks like an old-school American bakery with its neon sign but it’s a bakery as well as a pâtisserie. 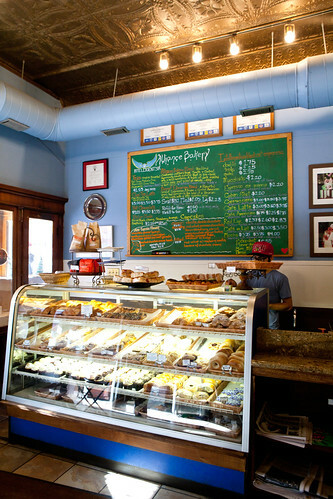 This two-personality bakery, so to speak, is owned by Peter Rios. Mr. Rios was trained as a hotel pastry chef (his previous title and employer before owning this bakery was Executive Pastry Chef at the Fairmont Hotel in Chicago) and had his skills sharpened by working through many well known pâtisseries and in France like Ladurée and won a number of awards in baking competitions over the years. 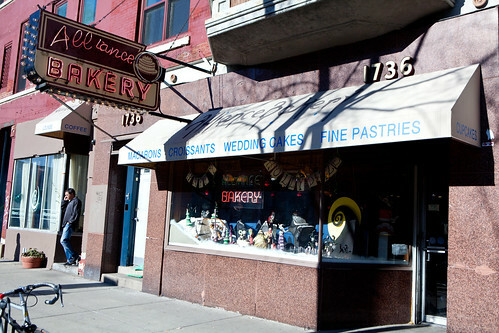 Alliance Bakery started over 40 years ago by a Polish family; about four years ago, Peter purchased this bakery. 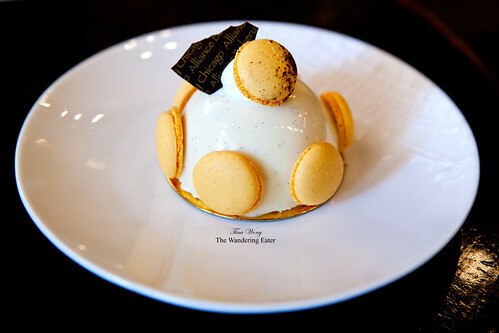 His somewhat quiet mission is to try to get Chicago’s sweet tooth up to speed with the big cities like New York to appreciate the modern, European style desserts. 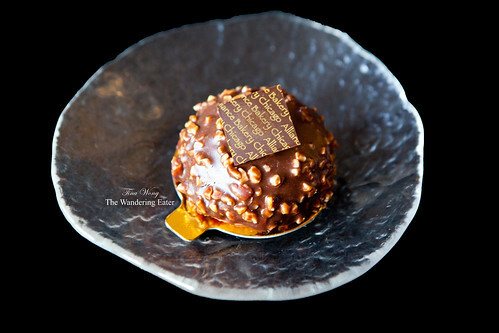 Whether or not you are a regular or a visitor you will enjoy for his pastries – American or French. 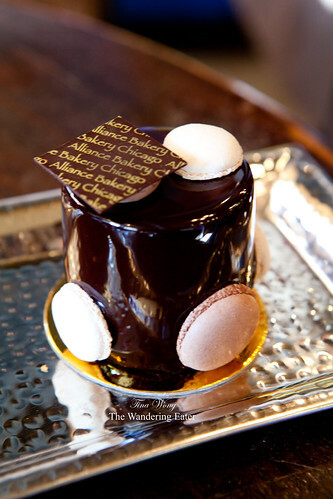 They use high quality ingredients (like chocolates from Cacao Barry and Valrhona) and his staff works nonstop to create the freshest cakes and pastries possible. Peter had some time to show me around his kitchens in the back. 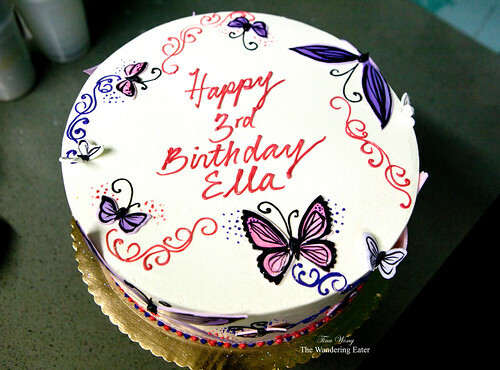 The first stop was the custom cakes department where he had two young ladies mixing frosting colors for clients’ cakes. Some cakes were adorable and some like the one seen above were pretty. 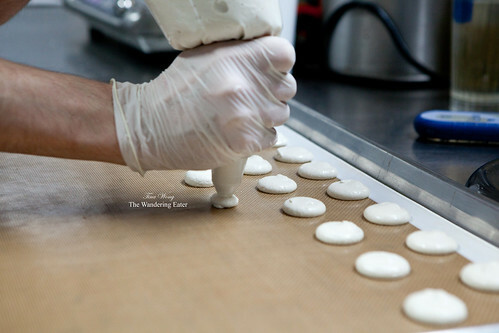 Room adjacent to the custom cakes was a larger kitchen area, one particular station had a young man beginning to pipe out a large batch of coconut macaron shells (eventually they will be filled with a lime ganache). 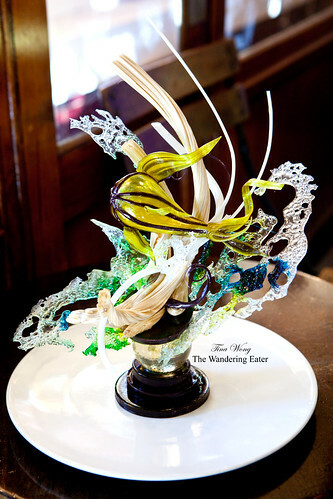 Eventually, Peter took out a stunning sugar sculpture (about 2 feet high) of an abstract underwater scene of tropical fish and coral. I have lots of respect for pastry chefs who can pull sugar. Working with sugar is a pain and even when you do pull it to a certain shape and it does harden, it is very fragile. Moving on to the actual baked goods, they are really fantastic. The beautiful, sophisticated entremet style cakes (about 3 inches in diameter) were wonderfully balanced in flavors and textures without being overtly sweet. 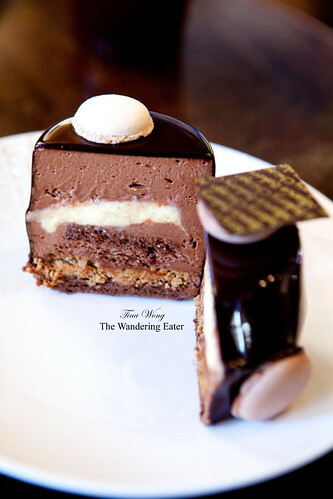 For example, Anne ($5.75 each for all cakes; seen above with its cross section) was filled with clould-like dark chocolate mousse (chocolate from Cacao Berry), vanilla bean crème, and a wisp of hazelnut crunch was utterly sublime. 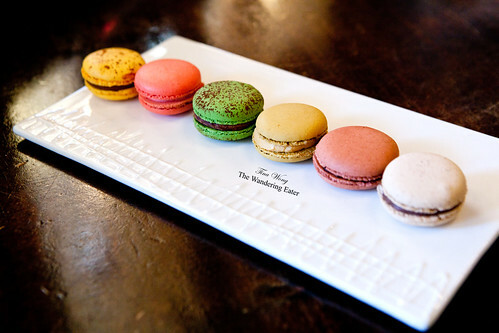 The macarons ($1.50 each; click on the photo for the current lineup) had great, potent flavors (the ones I had were good though the macaron shells were a bit dry). 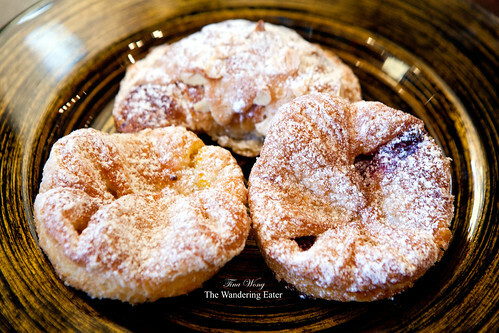 Their almond croissant and Raspberry and Apricot Orange Kougin Amanns ($3.25 each) were delicious, flaky pastries that I wish I have almost every morning with my cup of coffee. Their version of the Kouign Amanns are meant to be a bit more accessible to Chicagoans since not everyone might be familiar with the original Breton pastry, hence the addition to a fruit preserve. Nevertheless, thire Kouign Amann still has its flaky, buttery, sugar crusted essence without being too sweet. I did bring a few pastries back home with me. Of the ones that survived without being eaten by close friends when I presented it before them were the chocolate eclair ($3.50) and Michelle ($5.75). 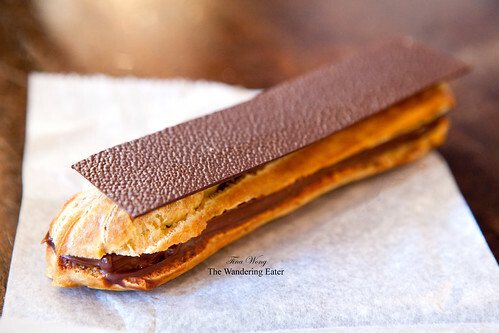 The chocolate eclair was textbook perfect with a good ratio of filling to choux pastry. The Michelle cake’s flavor reminds me of a French take of peanut butter and jelly, except the jelly would be raspberry jam instead. It’s actually filled with peanut butter cream, red berry gelée, peanut brittle, and chocolate cake. 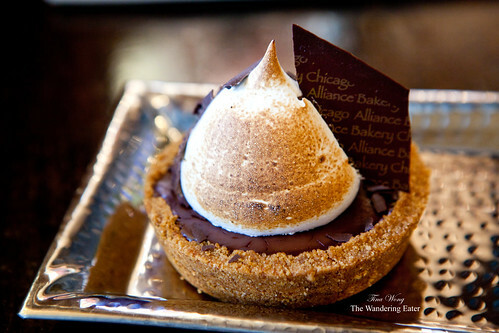 If you do visit Chicago and have a craving for well made, French-style pastries and cakes, I highly recommend going to Alliance Bakery. Wait.. one day in NY, the next in Chicago. I can’t keep up with you!! Everything looks so good. Would love for you to share your pictures with us over at foodepix.com.